Retail buildings are of five basic types; down-town shopping centres, single storey supermarkets, warehouse-type distribution centres , mixed use retail and commercial/residential buildings in which the retail units generally occupy the ground floor and superstores. The retail sector is very competitive and therefore the attributes of steel construction to deliver flexible, lightweight solutions fast and cost effectively makes steel the material of choice for the sector. Customer experience is paramount in retail buildings. Using steel construction, retail floor plans are maximised giving retailers the maximum scope to configure store layouts to maximise sales to their targeted customers. Many retailers, particularly supermarkets, are owner occupiers and therefore, unlike some other commercial sectors, they have a greater interest in whole life cost and added value through sustainable design. Consequently, the retail sector is leading in the procurement of sustainable, low carbon buildings. Large retailers also procure large distribution centres and many supermarket chains are diversifying and consequently procuring mixed-use buildings that for planning reasons often include a number of upper floors of residential use. Building layout, as dictated by the available site, access and parking, etc. Shopping centres, which may be multi-storey. The scale and form of retail buildings differs considerably, as do the constraints on their construction. The drivers in these five building sectors are described below. In all cases, early return on the investment is crucial to the success of the project, but this over-riding commercial requirement is also dependent in many ways on the environment that is created, and hence by the ‘shopping experience’. This means that architectural input is important despite the functional use of the space that is required. 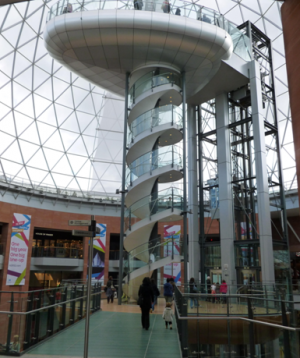 A good example of the architectural use of steel construction was in the Victoria centre in Belfast which involved creating covered pedestrian streets and a cupola viewing gallery using a tubular steel space frame spanning between multi-storey steel-framed retail buildings. The covered street-scape and viewing platform is shown below. For the supermarket sector, which is traditionally in the form of single-storey long span construction, their internal layout is driven by the target market. The key issues include the extent of the perimeter available for display, the collocation of preparation and display areas and the positioning of highly services elements to utilise shared services. Externally, the location and visibility of the store entrance and its relationship with parking and public transport are very important. As just-in-time logistics become more common, the location, size and operation of the goods yard, which is key to the efficient operation of a store, need to be carefully considered, particularly on restricted sites. Planning policy affecting supermarkets aims to direct development towards urban locations and to limit growth in car usage. In recent years, Planning Policy Statement 6 and Planning Policy Guidance note 13 have encouraged greater use of urban brownfield sites and the growth of town-centre convenience retailing. The latest planning policy document, the National Planning Policy Framework, continues this trend. In the past, planners have had a powerful influence on the appearance of retail stores encouraging bespoke solutions which can be difficult to extend or adapt. However, in order to make achieve maximum value from their supply chain, to achieve fast construction and to allow for long-term adaptability, supermarkets are adopting a ‘kit of parts’ approach. This permits flexibility in the specification of external and internal finishes while retaining the benefits of a standardised ‘shell’. Other planning issues that can affect retail developments, particularly main stores, include the potential costs of the Community Infrastructure Levy for community improvements and highway works. Supermarket construction is fast, with contract durations for new build stores of 6000–7000m2 typically ranging from 22 to 26 weeks. Rationalised design and standard products are necessary to achieve such compressed programmes. As for all construction clients, supermarket chains are concerned about reducing initial build cost, but as owner occupiers, they also take into account the long-term impact of investment decisions. They use payback and life cycle costing assessments to determine additional investment in flexibility, reduced running costs or sustainability. A store's target market will also influence the architectural design of the exterior of the building, and the materials that are used, glazing systems, floor finishes etc, that are partially determined by location, target market and projected turnover. Supermarkets also have extensive back-of-store facilities for staff, offices and storage. Target figures for total back-of-house space have fallen from 50% of gross internal floor area to 25-40%, depending upon the size and target market of the store. Parking, access and distribution are also key aspects of the design solution. The space for car parking is also extensive and in some locations, double level car parks are required. Most supermarkets are serviced at night which requires suitable access, turning and off-loading space. Superstores are generally located in suburban areas and are generally in the form of single-storey buildings, sometimes with mezzanine floors. Superstores display many of the features of supermarkets but are generally of longer span and have much lower proportion of ‘back of store’ facilities. The architectural input to these buildings has traditionally been limited as they are primarily functional spaces, but more recently, there has been more interest in reducing the visual impact of these, often rather plain looking and large plan, buildings mainly for planning reasons. More architectural solutions can be achieved by expressing the structure in some way, for example by use of external steelwork, curved roofs, and multi-coloured cladding systems, etc. A good example is the use of curved cellular beams for a car show room as shown. Distribution is a design driver because of the increasingly wide range of products offered by supermarkets and due to the step change in the efficiency of retail logistics. More efficient distribution, driven by automated technologies including mechanical handling and computerised inventory control, is enabling the overall proportion of space devoted to in-store storage to be reduced. Distribution centres serve major retail chains and major supermarkets and are often large single or two-storey buildings that are located near to the motorway network. Specialist companies, such as Prologis, offer distribution type buildings to a wide range of commercial enterprises. 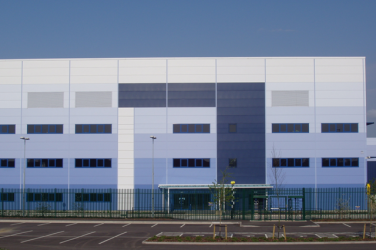 The John Lewis distribution centre in Milton Keynes (shown) is a good example of a 100,000m2 high bay building whose appearance is softened by the use of pastel shade composite panels for the cladding. Another example highlighting the use of external cellular beams is also shown. Many of these buildings are deigned to achieve BREEAM ‘Very Good’ or ‘Excellent’ and may incorporate some form of renewable energy provision , such as photovoltaic panels on their extensive roofs. Shopping centres in city or town centre locations are major building projects and are often the result of major planning decisions to improve the vibrancy of the area and to bring shoppers into city centres from competing out of town retail parks. These projects are complex because of the need to maintain the successful operation of existing roads, pedestrian access and local premises during construction and often require demolition of existing poor quality retail units. The nature of these projects is that they are multi-storey, and often 4 to 6 storeys high, and have expressive features such as entrance areas, atria, lifts and balcony walkways. A good example of a modern shopping and commercial centre is Cabot Circus in Bristol. The forms of construction are similar to multi-storey office buildings and involve use of long-span composite beams, and concrete cores or even steel cores for stability. The use of glass or architecturally-driven design solutions is important to reduce the apparent bulk of these major buildings. 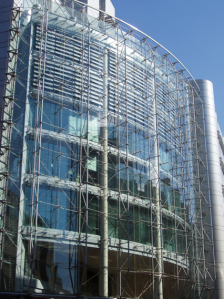 A good example of the use of a glass façade is shown. Often, car parking and access for distribution is located on one, two and sometimes three basement levels. This means that the substructure is key part of the design. Steel piling systems are often used for basements, as shown below. They can be painted and exposed visually. Many retail buildings now also include some commercial or residential space and are known as ‘mixed-use’ buildings. This may be required for commercial, or more commonly, for planning reasons. For example, in urban areas, two, three or four storeys of residential space is often built over retail units at ground floor, which has the advantage of maintaining the urban street-scape as well as creating a more vibrant community for those who use the new facilities. In many projects with long spans at ground floor and residential space above, the light weight of the structure of the upper levels is important to the success of the design solution. 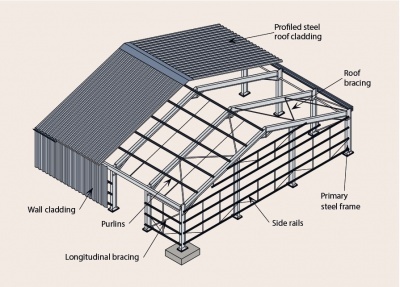 Therefore light steel framing or modular construction is often used for the residential part, and sits on long-span steel beams at the podium or transfer level. A good example of this is a 6-storey residential development in Manchester built in modular construction on a podium over a restaurant and retail outlets. It is less common for commercial space to be part of the mixed-use building except for major city centre developments, as noted above. Retail buildings come in many forms. Out of town retail centres generally comprise low-rise, long span buildings. Inner city retail projects are generally multi-storey buildings and often comprise underground parking. The anatomy of these forms of construction is described below. Single storey buildings are usually required to provide large open floor areas, with few internal columns, thus offering maximum flexibility in use and freedom for fit-out of the store and movement of pallets, etc. The consequence of this requirement is often a relatively light structural framework spanning from one side of the building to the other, which is clad with metal cladding and roofing. A good example of a single bay portal frame with curved rafters is shown. In this case, a mezzanine floor was constructed at one end of the building. The primary steel frame, comprising columns, rafters and bracing. The example shown is a portal frame, however, it is equally applicable to other types of structural frames. 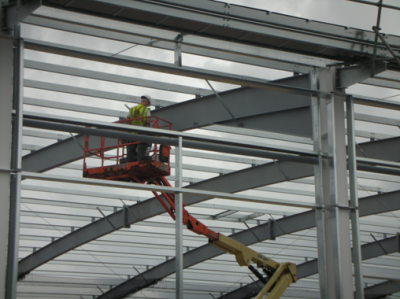 The secondary steelwork, consisting of side rails for the walls and purlins for the roof. The cladding will also normally include ancillary components such as windows, roof-lights, vents and gutters, etc. In most cases, the height of the building is around 6m, which is sufficient to permit the use of storage racking systems and often a perimeter mezzanine level, as shown. 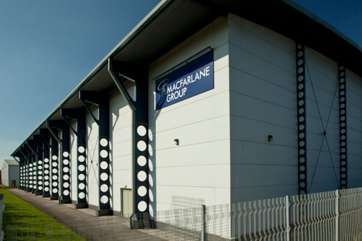 Single-bay and multi-bay buildings can be used, depending on the size of the building. Hipped roofs can also be created using portal frames, as shown. 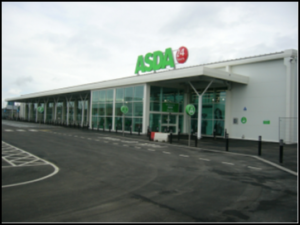 Supermarkets are generally single-storey buildings and incorporate sophisticated climate control (cooling and heating). Thay also have extensive back-office facilities and often architecturally interesting entrance areas, façade and roofing, including canopies. They are generally planned on a 10m x 10m grid, which allows for aisles and chiller cabinets either side. This tends to lead to columns at 10m spacing although the span can be increased to 20m. The structural system consists of beams and columns with additional bracing in the walls at certain locations, such as at the sides and rear of the building. The building height is generally about 4m and often one façade at least is glazed to full height. Offices, staff accommodation and specialist areas such as in-store bakeries, are generally located between the retail and storage area which is usually located at the rear of the store. 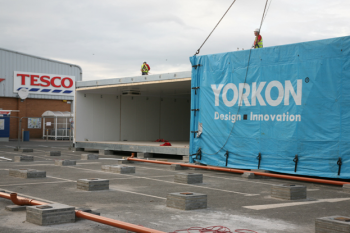 The use of modular construction is gaining popularity in single storey retail-type buildings, particularly where speed of construction is crucial to the success of the project. Modular units for refrigeration or specialist areas can also be used even in more conventional retail buildings. Distribution warehouses are similar in form to superstores but often contain high bay racking systems and can have overhead craneage. For that reason, they are often quite tall and have longitudinal crane rails at high level. The construction system that is often used is that of multi-bay ‘hit’ and ‘miss’ portal frames in which alternate internal columns are omitted and the missing columns are replaced by spine beams. This means that the use of the internal space is maximised. Columns are often on a 25 to 35m span and at 7.5 to 10m spacing along the building so that the internal columns on the ‘hit’ and ‘miss’ portal frames are at 15 to 20m spacing. Shopping centres are similar in form to other multi-storey commercial buildings and often consist of composite construction of 9 to 15m span at 6 to 10m transverse column spacing, which gives maximum flexibility in internal space provision for retail outlets. A good example of the use of composite construction was in the King Edwards shopping centre in Windsor (shown). In this case, the floor grid was 9m x 9m with secondary beams at 3m spacing. The steel decking provides support to the composite floor slab which supports the relatively high imposed loading of retail floors. These types of buildings are often highly serviced and so cellular beams with multiple circular openings are a common option as they provide for current as well as future servicing requirements. Many shopping centres require basement space for parking or for access and distribution, and in this case, shallow floor systems have proved popular as they reduce the depth of the basement and hence sub-structure costs. Steel sheet piling systems are often use for shallow basements of one or two floors. 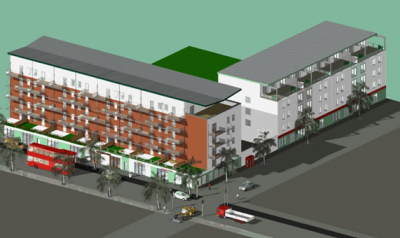 Mixed-use buildings are complex in terms of plan form because the different parts of the building give different structural and service distribution requirements. Often a podium level is created on which the residential levels sit. In this way the column spacing may be adjusted between the retail and residential levels. The use of a light steel or modular structure for the upper levels is a good solution to minimise the loads on the podium level. However, by careful design of the column locations, it is possible to use a compatible floor grid in both parts of the building. A conceptual study of the use of a shallow floor system in a mixed-use residential building is shown. In this case, the square hollow section columns were located on a 6m x 7.5m grid, and were designed to fit within the light steel separating walls and infill walls. Economy as a construction system. For retailers, early return on the investment in their buildings is very important. Steel structures are pre-fabricated, delivered to site on a just-in-time basis and rapidly installed by a small number of skilled personnel. Protective coatings to the steelwork can be applied in the factory. The speed of steel construction has made it the framing material of choice for the retail sector. A shorter construction programme reduces disruption and disturbance around the site, which is important when building in urban areas or extending an existing facility. The installation of steel frames, modules, infill walls and roofing is a relatively quiet process, it requires few site deliveries and does not generate waste. More complex installations can be carried out at the quieter times of the week to avoid disrupting the use of adjacent buildings. Speed of construction delivers an economic benefit, as shorter on-site period reduces the cost of preliminaries, reduces the period of financing and delivers a building that is operational faster – providing a quicker return on the client’s investment. The predictability and accuracy of steel components speeds up the process and allows follow-on trades to start their work sooner. This is important in the retail sector as it facilitates an earlier hand-over to specialist store fit-out teams. Most retail type buildings are driven by speed of construction, which also leads to economic benefits. Steel construction has a dominant market share in the retail sector for these reasons. Information on the cost of structural steelwork generally and cost planning for supermarket buildings specifically is readily available. Steel construction with multiple openings also saves on the service distribution costs, which is important because these types of buildings are highly serviced and also require flexibility in future re-servicing for different types of retail outlets. Lightweight construction is important for building on formerly built up areas with pre-existing foundations and obstructions, and even building over underground lines, etc. The loads imposed by a steel frame are up to 50% less than those of a concrete alternative. 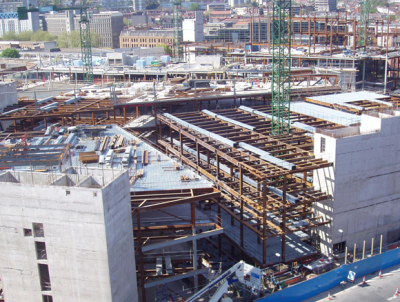 Foundations are a major component of overall building costs, particularly in urban shopping centres, so lighter foundation loads can have an important impact on overall project costs. The use of long span construction creates open column-free space that is flexible to changes in the space provision of retail space. Service integration within the structural depth of steel frames not only reduces the cladding area/cost and hence heat loss through the building envelope, but also provides for freedom in future serving requirements. Slender columns using concrete filled hollow sections support high loads and reduce the visual impact of the structure, which is important in multi-storey shopping centres with commercial or residential levels above. Sustainability is driven by the planning requirements for the project or by the client’s wish to demonstrate their sustainability credentials through the physical design and operation of their buildings. Many clients consider that BREEAM ‘Excellent’ is the preferred standard for retail type buildings, and some buildings have achieved ‘Outstanding’. The versatility of steel construction makes it the ideal structural material for retail buildings, which require careful design in terms of access for customers and deliveries, effective operation of the building, and creation of public open space and safe means of escape in fire, etc. Supermarket buildings comprise, in addition to sales areas, back-of-house accommodation including offices, cafeterias, specialist areas, such as bakeries and storage areas. In many single-storey stores, mezzanines are used to provide additional sales area cost effectively. 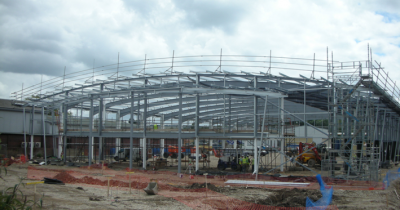 Steel structures enable retailers to adopt a ‘kit-of-parts approach’. This permits flexibility in the specification of external and internal finishes while retaining the benefits and efficiencies of a standardised shell. The following forms of construction are commonly used in the retail sector. 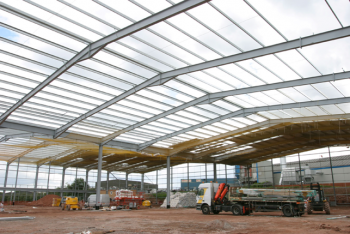 Portal frames are often used for single storey superstores and distribution type buildings. The typical form of a single bay portal frame is shown. Spans of the portal frames are typically in the range of 25 to 40m and frames are placed uniformly at 6 to 10m spacing along the building. Roof slopes can be as low as 6°. The height of the portal frame is dependent on the functional use of the space. The height to eaves level can be as low as 3.5m, but is more likely to be 5 to 6m to permit the use of a mezzanine floor in the original or future deign, and also for storage racking. Large doors for delivery can be located in the end gables or between the side columns. The end gables are often designed also as portal frames to permit future expansion of the building. For more guidance on portal frames and their design, refer to SCI P399. For multi-bay portal frames, ‘hit’ and ‘miss’ construction is often used where alternate internal columns are removed and replaced by a spine beam. In this way, larger column-free internal space is created, which is more suitable for warehousing. The external columns are often arranged on a 7.5 to 10m grid and so the internal columns are at 15 to 20m spacing. Curved rafters and cellular beams are increasingly used in portal frames, primarily for architectural reasons. Trusses are less often used in retail type buildings, as they are associated with very long spans of 50 to 80m. However, trusses may be used for distribution buildings particularly national distribution centres requiring tall space for high-bay racking. 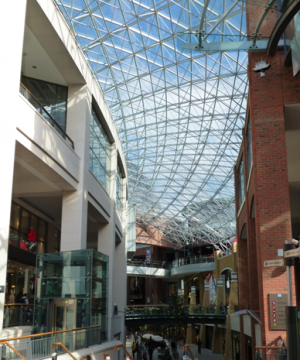 Some atria and tall entrance areas in shopping centres use tubular trusses to support glazing systems. Building envelopes for single storey structures are similar to other similar building types, and are in the form of metal cladding with roof lights and side sheeting. These buildings are often designed to a minimum roof slope of 6° and so weather-tightness on shallow roof slopes in exposed areas is an important part of the design. Composite or sandwich panels are often used in this sector because they are fast to install and are long spanning and highly insulating. In large buildings, stressed skin action of the cladding may be used in design to control horizontal deflections. Photovoltaic panels are often supported by the roof cladding and purlins. Portal frames are braced in their longitudinal direction and in their end gables, but are otherwise designed as moment resisting frames using deep haunches at the beam-to-column connections. Multi-storey buildings in city centre shopping centres are also braced generally around the cores or in brick-clad walls. The nature of these types of buildings is that the space for bracing is limited. Composite construction is an important aspect of the design of floors in retail buildings because of the relatively heavy loads that are supported (5 to 7.5 kN/m2 imposed loads typically), and their ability to provide stiff and long spanning structural systems. Long span construction is a pre-requisite in the retail sector. For multi-storey shopping centres, which often comprise commercial or residential space above, long span beams are typically 12 to 18m span. Solutions include cellular beams or fabricated beams with isolated web openings for major service ducts. 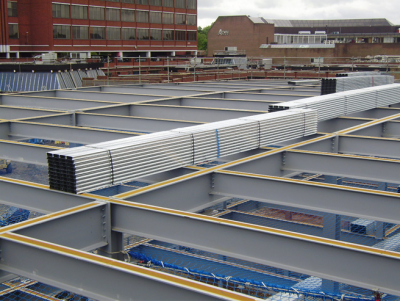 Composite floor slabs are often used in the retail sector and are generally 150 to 180mm deep and span 3 to 4m between secondary beams. Their load capacity is high and they achieve up to 2 hours fire resistance. Shallow floor systems have also found a niche market in the multi–storey retail and mixed-use building sector especially where the building height is controlled for planning reasons, and therefore the minimum structural depth is crucial to the success of the project. 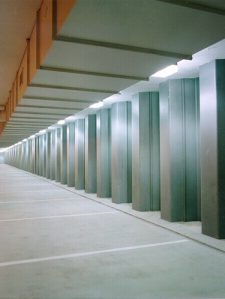 Shallow floor systems are also often used in basement car parking to minimise the sub-structure costs. The key issues in the retail sector are as follows. Retail construction is fast, with contract durations for new build stores of 6000 to 8000m2 typically ranging from 20 to 26 weeks. Rationalised design and use of standard components are necessary to achieve such compressed programmes. However, high-level prefabrication of building envelope and services distribution components has not been widely adopted. High level of services distribution to increase flexibility of use and for re-planning of the store. Rainwater harvesting and sustainable urban drainage. 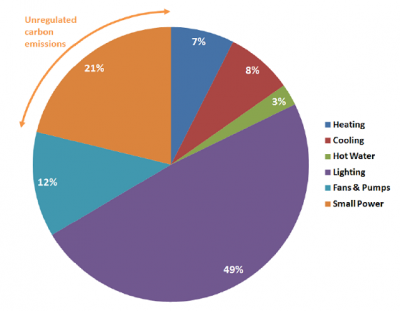 The breakdown in operational carbon emissions by energy use in a typical supermarket is shown. In addition, the leakage of refrigerant greenhouse gases from chiller and freezer cabinets in retail buildings is also a potentially significant contributor to the overall carbon emissions. In this supermarket, lighting was found to be the most significant energy demand, accounting for around a half of the total operational carbon emissions. Consequently efficient lighting systems coupled with optimum rooflight design are important in delivering operational carbon reductions. The complexity of the interaction between building orientation, rooflight design, lighting systems and daylight dimming lighting controls in supermarket buildings requires detailed dynamic thermal modelling in conjunction with good lighting design to develop an optimum lighting solution. As shown, the proportion of operational carbon emissions from heating (7%) and cooling (8%) are very similar and therefore energy efficiency measures which impact this heating/cooling balance are difficult to optimise. Measures to reduce heat loss or increase solar gains, reduce emissions from space heating but increase those from cooling. Similarly measures that increase heat loss or reduce solar gains, increase emissions from space heating and reduce those from cooling. In many new retail building projects, it is required to provide a proportion of on-site energy generation from renewable sources (the so-called Merton rule). This is normally about 10% of the buildings energy use and is generally provided by means of low and zero carbon technologies such as photovoltaic panels, ground sourced heating and cooling, e.g. by thermal piles and, in some more exposed locations, building mounted wind turbines. Efficient lighting of large, low rise, open buildings such as supermarkets and distribution warehouses is highly dependent on the presence and configuration of the shelving and racking systems used. Where obstructions such as high bay racking are installed, the building is effectively split into a number of narrow, corridor‐type spaces which require many more fittings, and hence more energy, to achieve the same level and uniformity of lighting. Further information on lighting and racking in retail and warehouse buildings can be found in the Target Zero supermarket and distribution warehouse reports and by following the External links. Thermal insulation of the building envelope is traditionally the architect’s responsibility, but the structural engineer must be involved in the development of appropriate details. 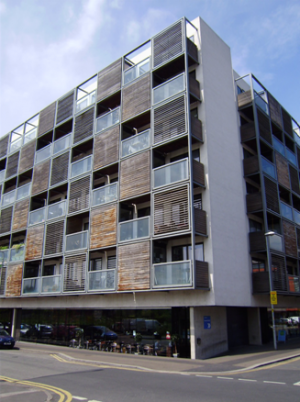 For example, supporting systems for cladding should be addressed, and steel members that penetrate the insulation, such as balcony supports, should be detailed to minimise the effects of ‘thermal bridging’. The Target Zero supermarket design guide provides in depth guidance about how to achieve low and zero operational carbon targets in supermarket buildings. The BREEAM environmental assessment scheme provides a method for quantifying the environmental performance of buildings. Although the scheme is voluntary, many retail sector clients, particularly the large supermarket and department store chains, are responding to demand and adopting BREEAM to deliver buildings which are low energy, sustainable and future-proofed. 10.1% to achieve BREEAM ‘Outstanding’. Service integration is important in the retail sector because of the requirements for independent servicing of the retail outlets, which includes effective ventilation, smoke extraction, refrigeration, etc. the facilities needed for maintenance and future re-servicing, and the space for centralised mechanical plant which is often located on the roof or in the basement. Most services are distributed at ceiling level rather than floor level. 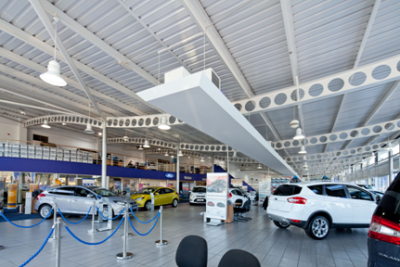 As noted earlier, cellular beams are often used in the retail sector because of their ability to provide for current and future servicing. Advice on service integration is given in SCI IEP2. Fire safe design is important in retail buildings, both for provision of effective means of escape in a fire and also to protect the asset value of the building and its contents. For single storey buildings, the means of escape is less of a design problem, whereas in multi-storey buildings, it is of crucial importance to the design solution. For large shopping centres, Approved Document B refers to BS 5588 Part 10 (since replaced by BS 9999) for the design of fire precautions. The fire resistance of shopping centres in this standard is generally 120 minutes and a life safety sprinkler system is also required. Engineered approaches however had had considerable success in demonstrating that the 120 minutes requirement can be reduced. Where fire protection to structural steelwork in retail buildings is required, guidance on the pros and cons of different methods can be found by following the link here. Information on the acoustic requirements and performance of building envelopes can be found here. For separating walls, it can be found by following the link here. For floors and walls such as those that might be found in large retail buildings, guidance can be found here. Control of floor vibrations is important in public spaces, especially when some form of rhythmic activity may take place. The control of vibrations is based on three principles: designing the natural frequency of the structure to be at least three times more than the maximum forcing frequency isolating the structure from the potential source of vibration, and finally adding to the mass or damping where it is structurally sensible to reduce the floor response. The maximum walking pace is about 2 Hz and therefore (to avoid the third harmonic frequency) it follows that the minimum natural frequency of the structure should be at least 6Hz (i.e. 3 x 2Hz) in public spaces. The nature of the random footfall of shoppers is that occupied spaces are less affected by vibrations than lightly occupied spaces. Lifts and escalators are often the source of forced vibration, and if their component frequencies are close to that of the structure, they must be isolated from the structure that supports them. For more guidance on control of floor vibrations in steel-framed buildings, see SCI P354 or Steel Construction: Floor Vibration. A web-based Floor response calculator is also available. Car parks are often associated with large retail complexes and steel framed car parks are a common solution. Column spacing of 5.2m and 7.5m align with 2 or 3 car park spaces and spans are often 4.5m, 7m and 4.5m so that a central aisle is created. Long-span steel framed car parks are also popular and 16.5m is the common span in these cases. Basement car parking in multi-storey shopping centres or mixed use buildings conforms to the shorter span systems noted above. Shallow floor systems are often used to minimise the floor zone in car parks and in basements, so that the floor to floor height is often only 2.5m. Single storey building construction normally takes place using mobile cranes. The purlins are installed and the connections are finally bolted from mobile platforms (MEWPs), as shown. Multi-storey retail building construction is similar to that used in other steel-framed buildings. In city centre projects, special requirements may be placed on the method and time of working, access and deliveries to avoid affecting neighbouring premises. Often site huts have to be installed at high level on a temporary structure above the street level and materials are stored on platforms, etc.